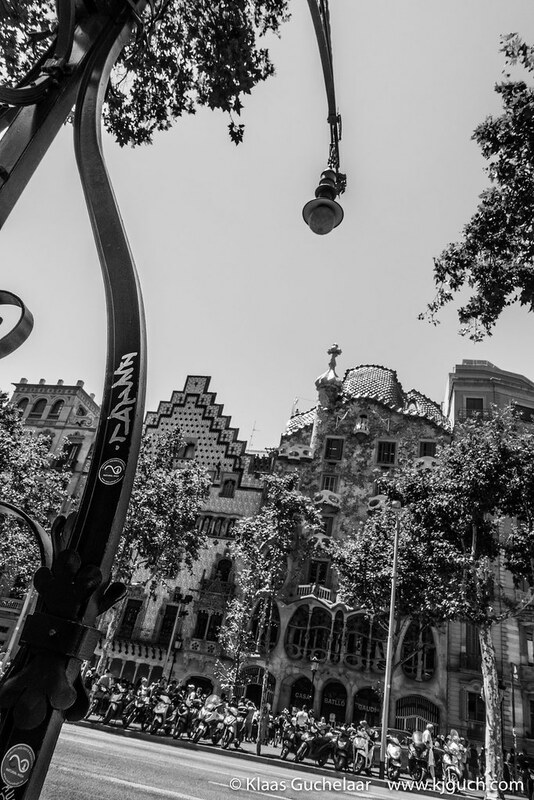 This is the first of two belated post of my travels to Barcelona this year. In all the traveling and other things I forgot to post these, even though the travels were really good. 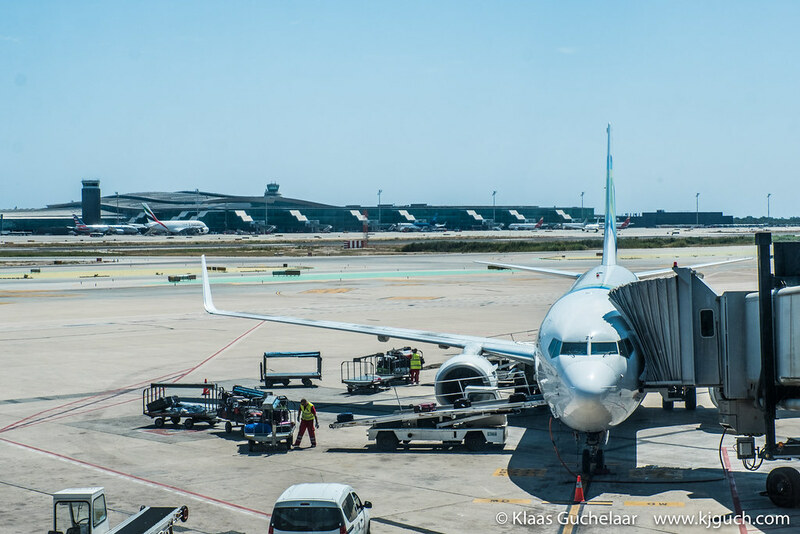 In July I traveled to Barcelona not with just my regular additional luggage, but with an extra big case as well for a really interesting trip. I have been in Barcelona various times now and normally when Monica works in the daytime, I wander around the city. And that’s nice, but this time I was staying nearly two weeks and I wanted something more then just walking around. 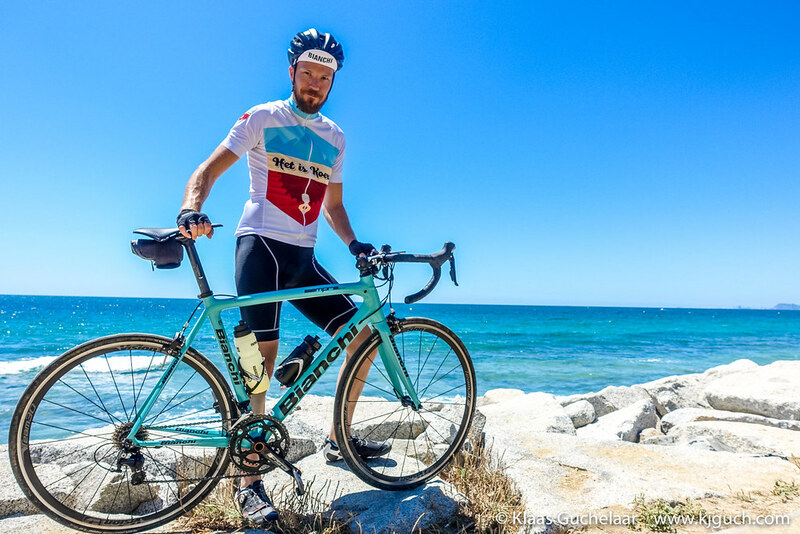 Also… I bought my Bianchi last year and really wanted to take that abroad. 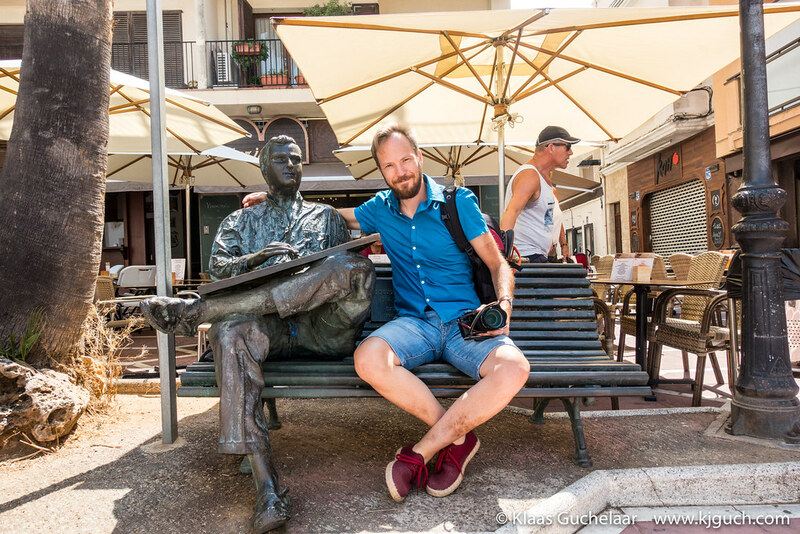 This blog will therefore mainly focus on the experiences on the road (sorry Monica). 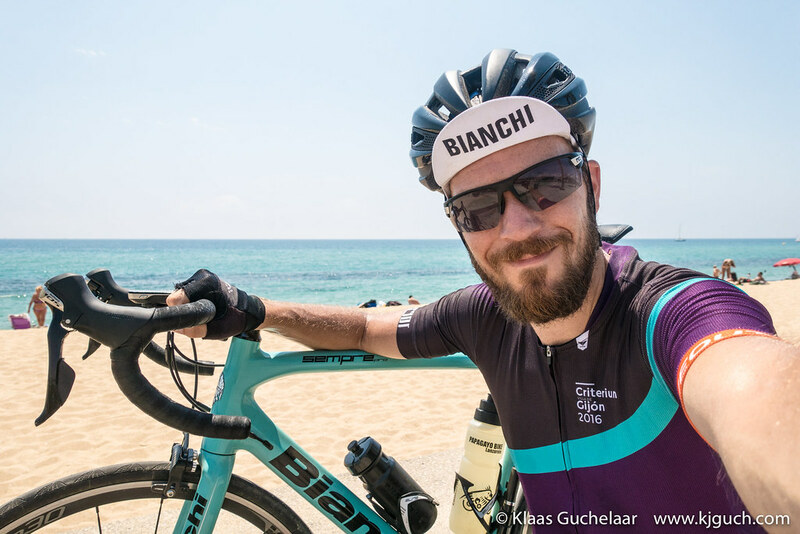 As a general test cycling on a rented roadbike on Lanzarote was great (earlier this year we had a family vacation on Lanzarote, I travel a lot ;)), but nothing beats riding on your own roadbike. Also renting a roadbike costs around €65 to €75 per day for normal types. So with many thanks to Vanslag for selling me a really decent bike travel case for cheap, all I had in costs now was €100 for taking the bicycle along and back again. Well… OK there are a few more costs. I drove to Schiphol instead of going by train so there is the fuel and parking to take into account, but still. 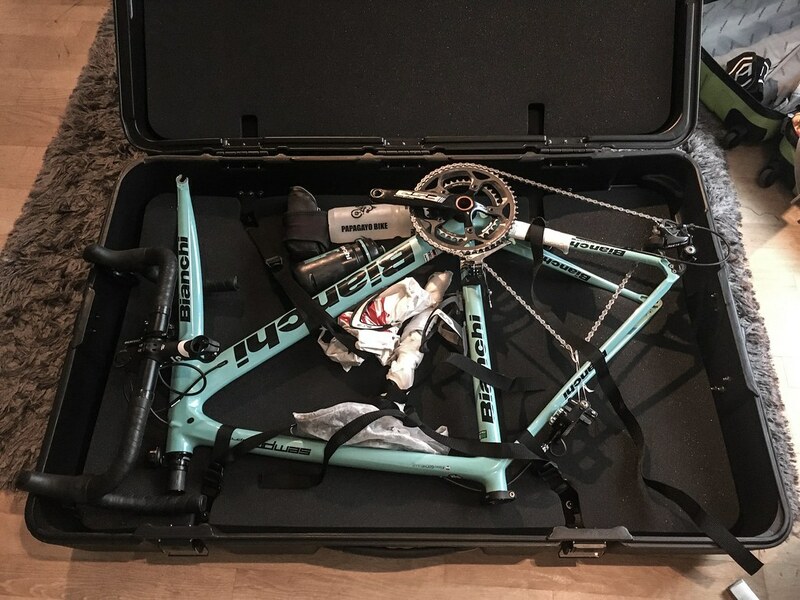 So once the arrangements were done, all I had to do was make sure the Bianchi was safely in the box and I was set to go. The flight on June 29 was dull with not many views other than clouds. Arriving however was a bit more exciting: will my bicycle also arrive? Luckily it did! With a little maneuvering I got my backpack, my normal luggage and my bike-box on the Aerobus and was in the center of Barcelona a bit later. Monica was already waiting for me and together it’s a lot easier to drag the luggage. The taxi’s were on strike that day and we had a little luck with the bus which wasn’t too full and the busdriver kindly allowed my enormous bike-box on the bus. And a little walk and lots of ogling eyes to my bike-box later (Who is that? Is that a known cyclist?) we arrived at the apartment. We left the luggage for what it was and went out for drinks and dinner. It takes a little time to get accustomed to the way of cycling there. When there are cycling lanes, they are often only separated from the pedestrian lanes by a painted line. 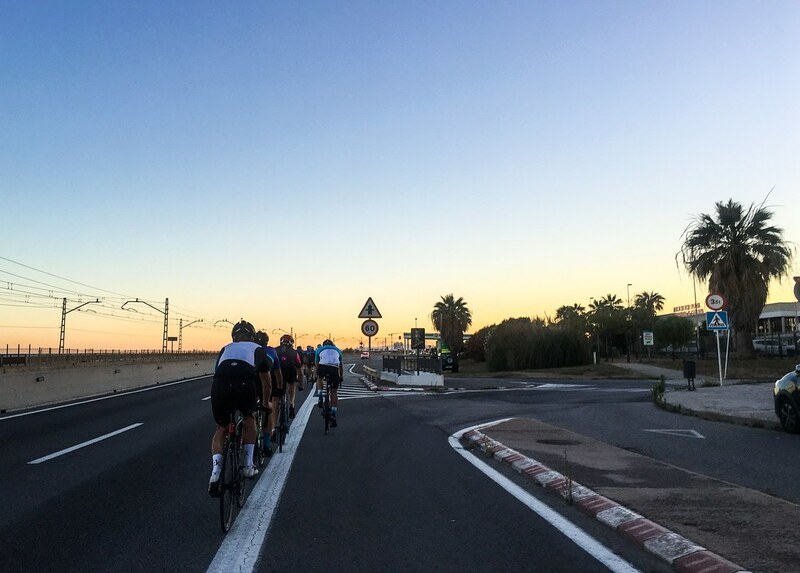 However more and more there are real cycling lanes next to the roads and if both are missing, you mingle with the cars and that takes a bit of getting used to with one-way roads, three lanes wide and not one care caring whether you’re new to this. 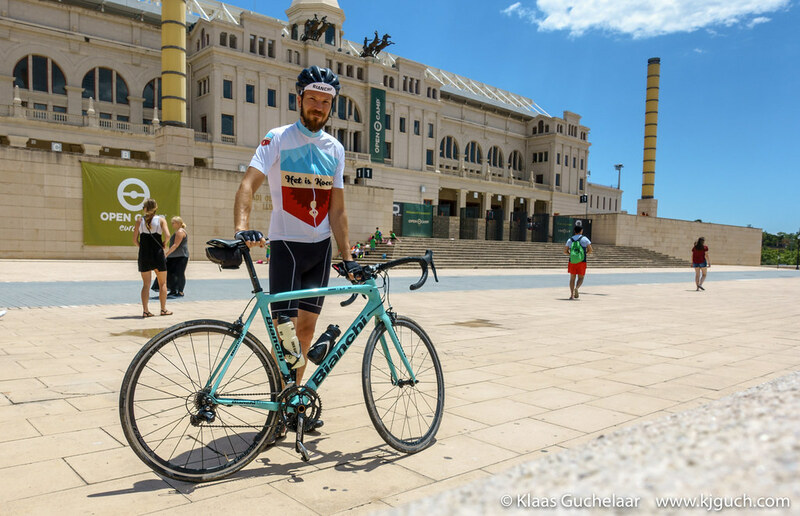 So for my first ride I took my time going down gently by Diagonal down to the beach, then along the beach to and up Montjuic and from there back to the apartment. It must be more or less the slowest ride on my Bianchi yet. 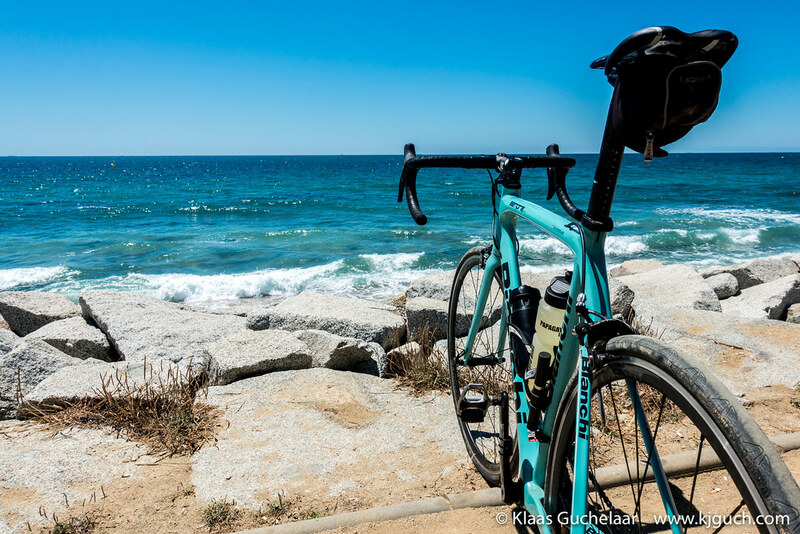 With my Bianchi at the Spanish coast, how cool is that? With just over 37km the ride was not too long, but took a good two hours anyway. Under normal conditions I’d be horribly ashamed of a result like this, but now I was just extremely happy to have done my first kilometers in Barcelona! Freshly showered I did a little round on foot before Monica returned and we started the weekend. I didn’t want to do too much cycling in the weekend as that was to be spent with Monica so on Saturday we had a nice relaxing day out in Barcelona. 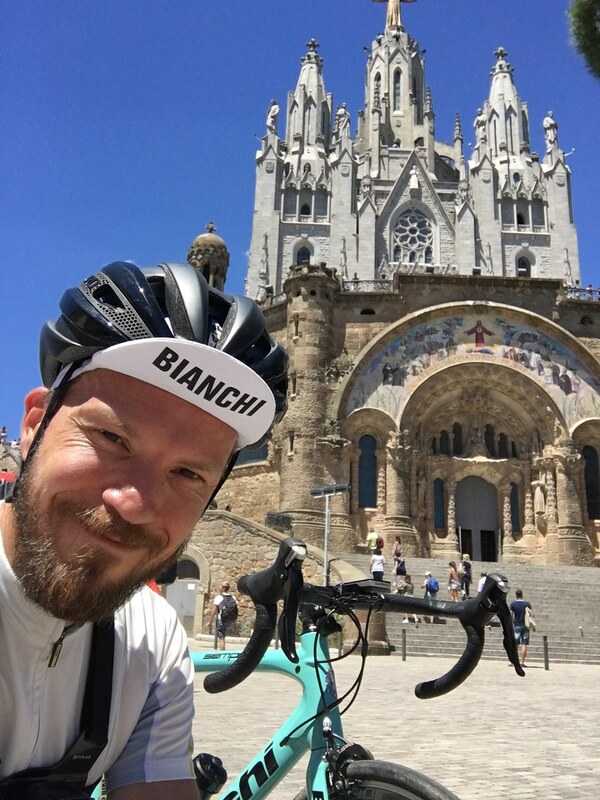 On Sunday I got to do a little ride as I wanted to try my cycling luck on Mont Tibidabo. My first serious climb in Barcelona. And serious it was. There are two ways up Tibidabo and naturally I chose the the wrong one, but in the end I did reach the top. As it was a really short ride to only go there and then back home I added a second climb cycling up to the entrance of Park Guell. 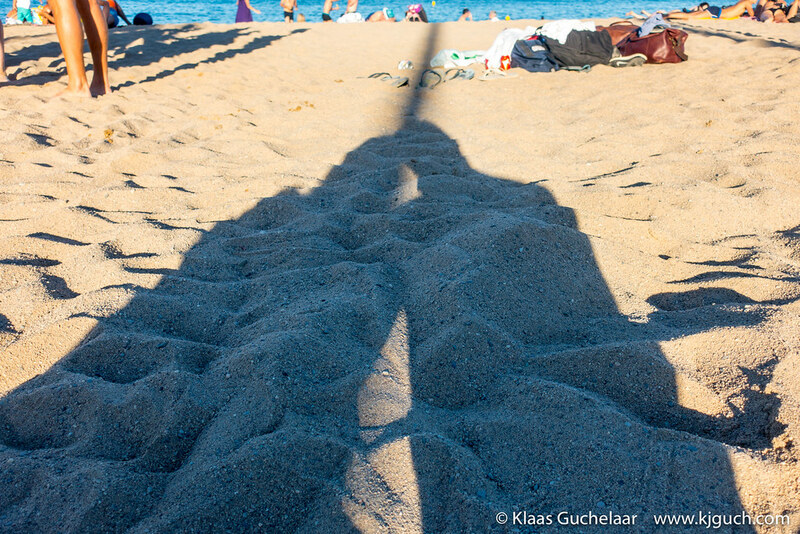 Then quickly back home again and we spent the afternoon taking the sun on the beach. On Monday once Monica was off to work it was time for my first serious ride. I had met Spanish traffic, I had my first experiences doing a little climbing so now it was time to put it into action. I was told that you can cycle up (and down) the coast for nearly 200 kilometers. I didn’t want all of that in one day, but starting a nice ride along the coast seemed like a good start. Along the Costa Brava, how well does the frame match the sea! It turned out that it’s a nice ride if you’re not in a hurry and have wide wheels (something really uncommon for roadbikes). 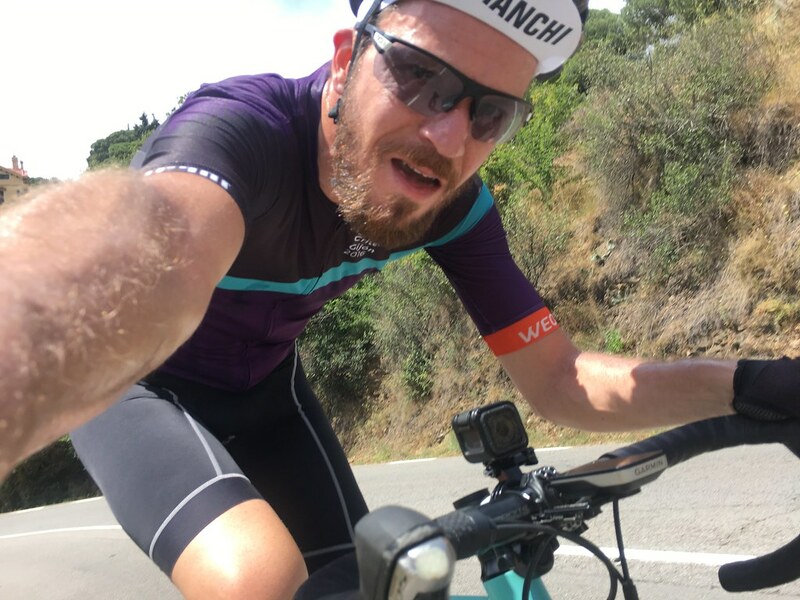 The road along the coast is riddled with tourists so you can’t get a decent speed going and I met loads of wooden bridges where the planks were laid in length and not width, which means that your wheel will fall into the gap if it’s small. After two narrow escapes I crossed the bridges with extreme care and eventually made it to Mataró. Turning the bike around and simply going down the same way seemed boring and with the bridges in mind not a good idea, so I headed inland in the direction of Granollers and then to Sabadell. Quite a ride and with several steep climbs along the route. From Sabadell I headed back to Barcelona. a 113km ride in 5 hours an 17 minutes, now we’re getting somewhere! 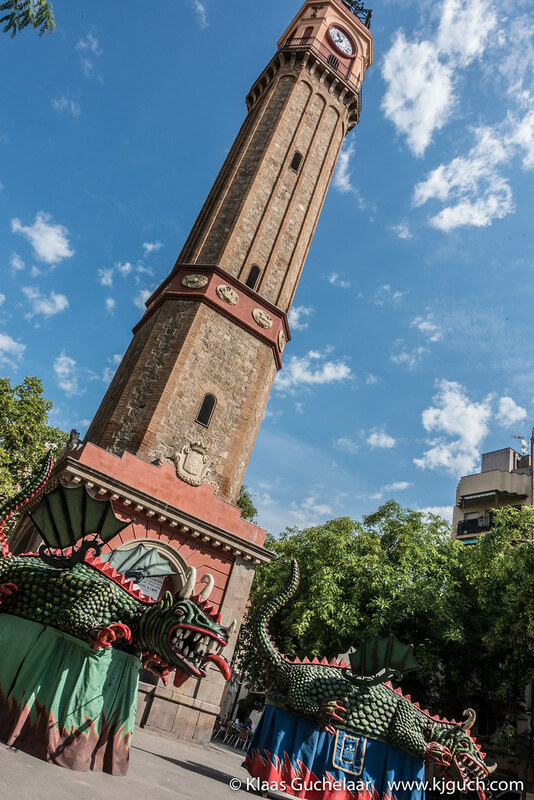 Via via I got in contact with a Meetup-group that has several rides in Barcelona and everyone is free to tag along, although some expertise is (very much) recommended. 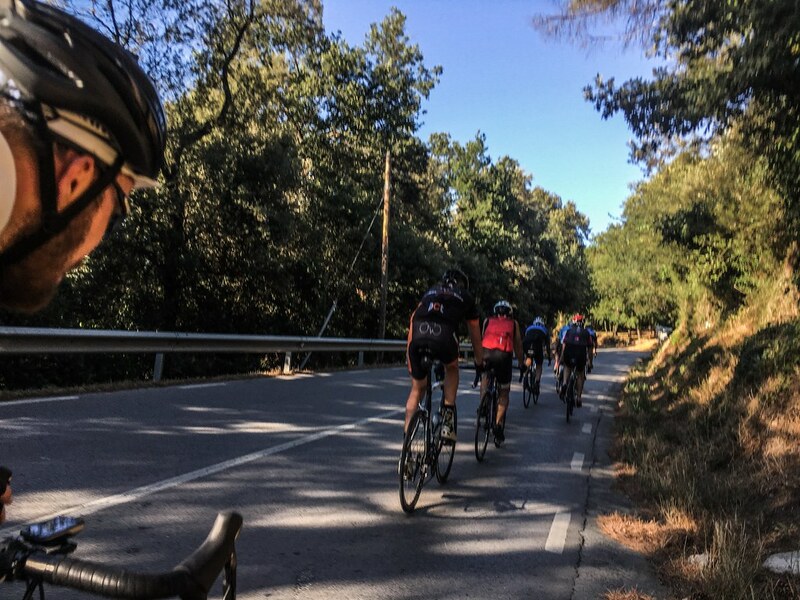 They were going for a ride on Tuesday evening, so my plan was to take it a bit easy in the day (with the Tibidabo climb on Sunday and a 113km ride with also 1km in climbing I could do with a bit of a rest). So I walked the streets of Gracia and enjoyed the sun a bit. By the end of the afternoon I unfortunately had to lead home a little time before Monica gothome from work and I arrived at the meeting point and one after another the other regular members of the Meetup group arrived. As it turned out I was not the only new guy, there was an American too who was staying in Barcelona for a month and a half with his family. After introductions and some small talk we were off for a serious ride. I quickly found the speed was more than a bit higher than I’m used to and there were going to be two steep climbs in our route. I had some trouble keeping up with the pace, however by the time we reached the first climb the group was together. Going up the climb it’s every man for himself and on top we wait till everyone has arrived. Going up was hard. Really hard and so I was more than a little surprised that I wasn’t even the last one to make it to the top. One or two arrive after me and we even had to wait a good ten minutes for our American friend. Once we were all together again we went down the mountain and headed towards the beach. Here we stopped and we got an option: one of the regulars was heading back to Barcelona immediately, so we could join him and be done with it. Or we’d follow the rest for a gruesome second climb. The American decided he’d prefer a more relaxed speed and headed home and I decided that I’d not get many more opportunities than this and so I headed for the second climb. That was easier said then done. This was the hardest climb I’d ever done and the only reason I could manage was that one of the group was fairly close in front of me. But I’ve never ever breathed so heavily, felt my heart pounding so loudly in my life. Nearly at the top the group was waiting. I should have gone a little further to reach the top, but just could not make it any more. 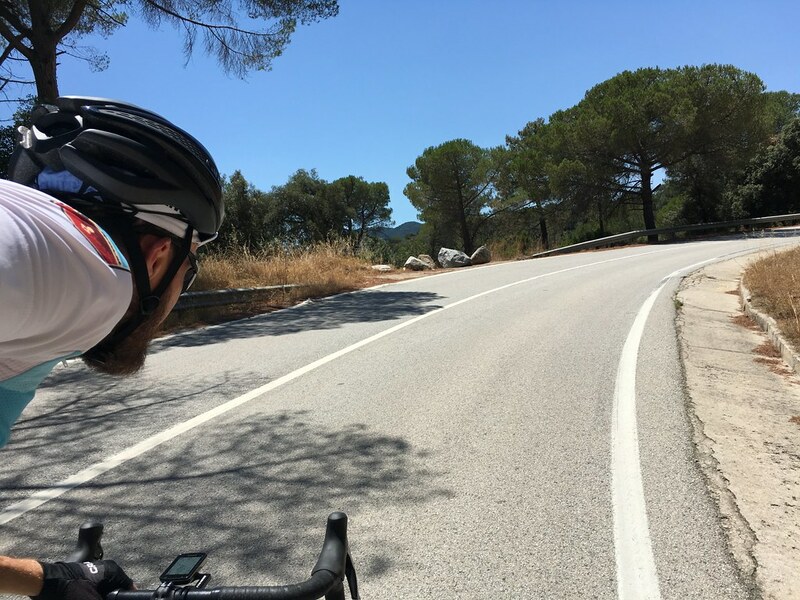 We headed down the mountain (mostly full on breaks as the road was not straight and in really bad condition) and then at high speed on the road along the coast back to Barcelona. I’m much in dept to Oli (one of the guys) for taking me along, as I simply could not manage the speed of the group. 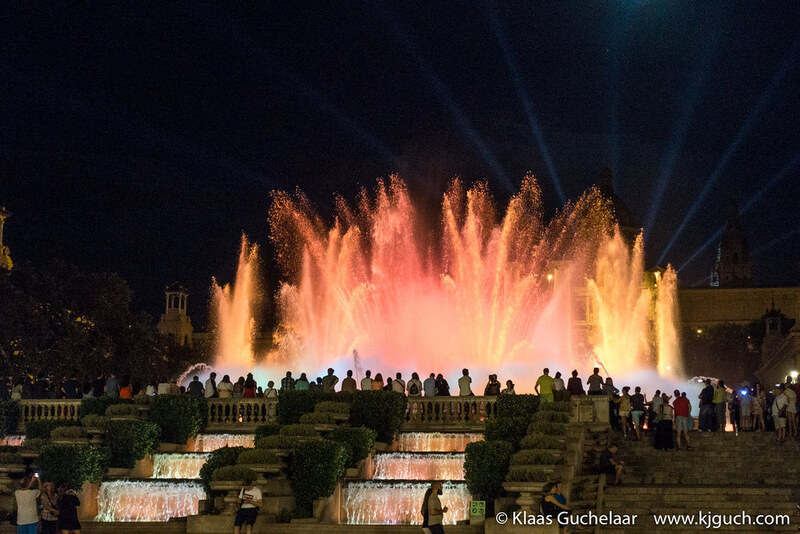 Once back in Barcelona and after a beer the group split up and I went back home. The hardest ride ever but it was awesome! Back home, totally knackered Monica prepared the most wonderful pasta, gracias!!! Wednesday came and it seemed like a really good idea to not cycle for a day as my legs were about to strangle me. So I took it easy for a day and visited the bike-store near Monica’s apartment where I bought myself an awesome new cycling-shirt! I met Monica for lunch in the afternoon and in the evening we visited some bodegas. I love the atmosphere in them, especially the old ones. They’re always full, have great food and the vermouths are great. 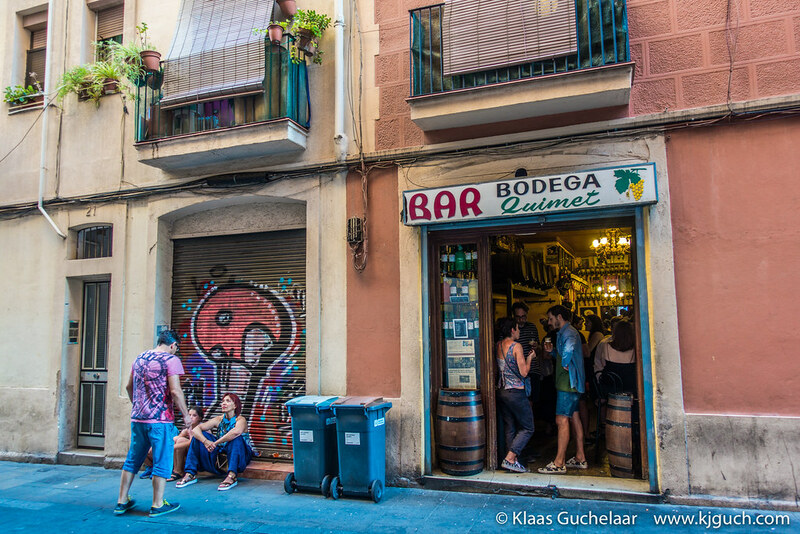 Bodegas, a recent discovery but how great are they! On Thursday I was back on the bike (in my new shirt) and headed into a different direction. 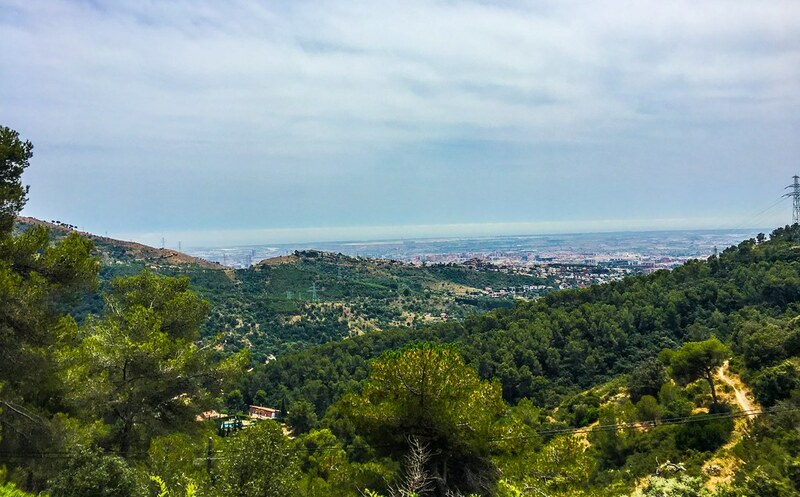 After aiming for Tibidabo I changed directions halfway on the climb and changed my directions to Molins del Rei. Via el Paliol I set a course in the direction of Rubi, but as I saw it was already well into the afternoon and I wanted to be back home around the time Monica came back, I decided to head back a bit sooner. 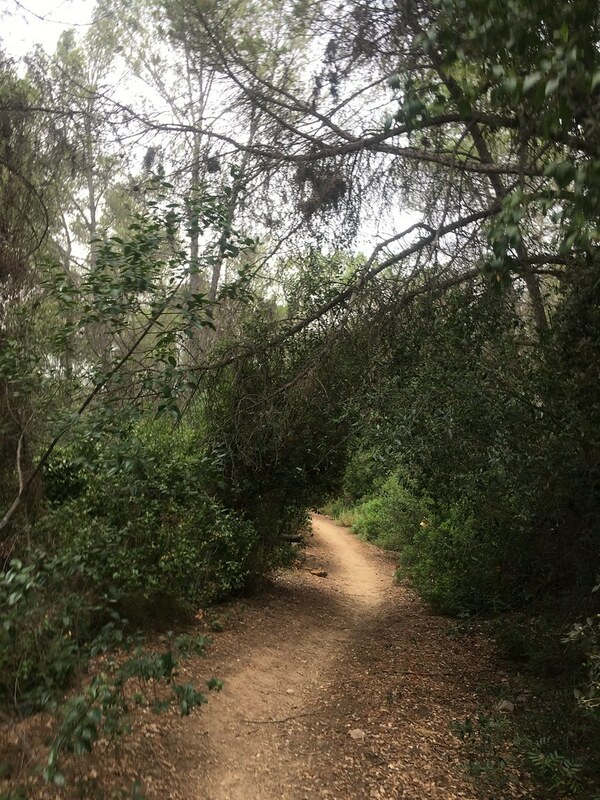 This got me into a world of trouble as the road looked alright on Google maps, but in reality… I was suddenly out of road, heading down a sandy path that got worse and worse. I had to get off the bike and walk a bit as it simply was impossible to cycle, never mind trying it on a roadbike… an actual road is a bit of a necessity. Eventually I found a gravel road that at length became a normal road and from there I found Barcelona again. I really needed a mountainbike today. The ‘road’ got a lot worse shortly after this, really this is a good bit of road! On Friday a short ride into the mountains. Monica only had a short day and then the weekend would start and the weekend was to be together again and so no cycling in those days. But on Friday a short ride was good. It was a mere 35km but with some really hard climbs and fantastic descends. I headed in the direction of Molins del Rei again, but a somewhat different road and I didn’t completely go into Molins del Rei. 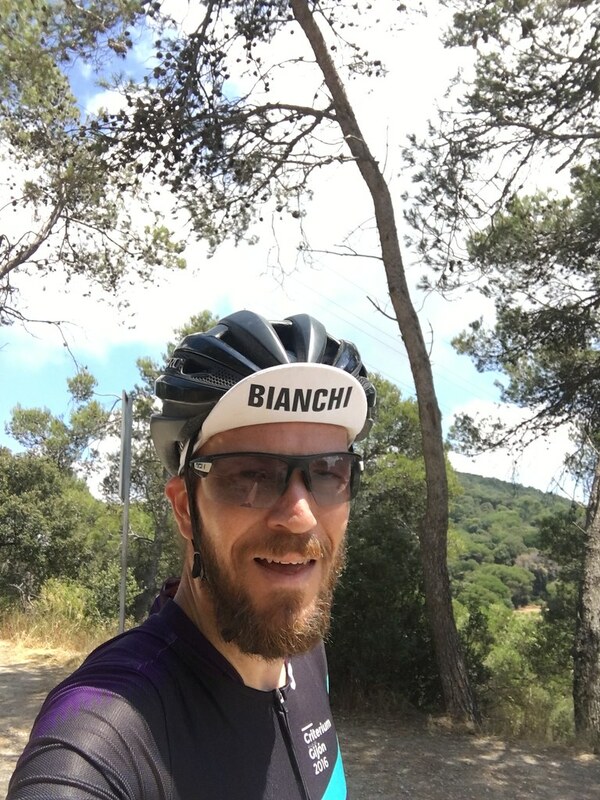 My plan was to at some point turn the Bianchi around and head back the same way and as I was descending I realised that as steep down it was going now…… I was going to go back up there too and so I selected a point where I felt it was a good moment to head back and headed back home. Hard work, but gratifying still. And then it was weekend. 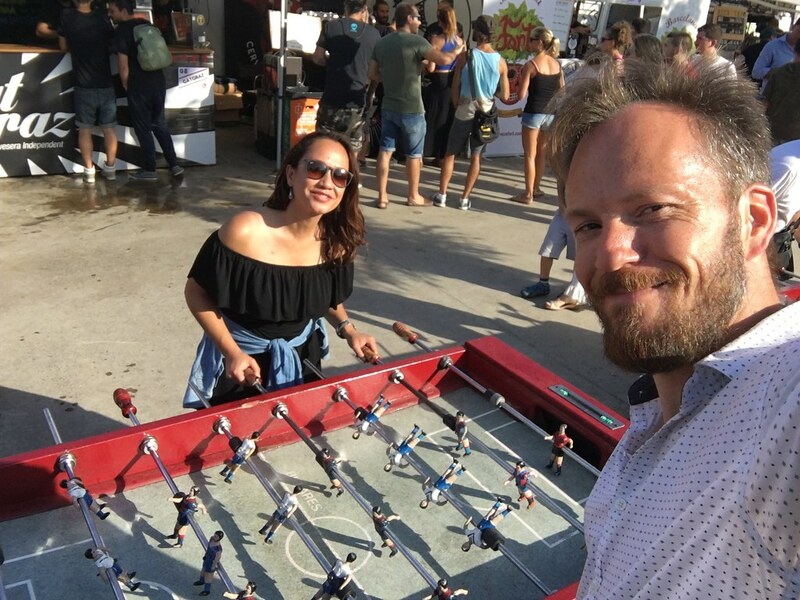 On Saturday we had a fantastic day, we visited a beer-festival near the beach where we had some fierce table football matches, tasted wild exotic beers and waited an enormous time for a band that never actually started playing and then walked back up along the beach. In the evening we visited a fantastic location for concerts: the Grec, a ancient Greek styles theater where Banda Municipal de Barcelona was performing with guest singer Santiago Auseron. 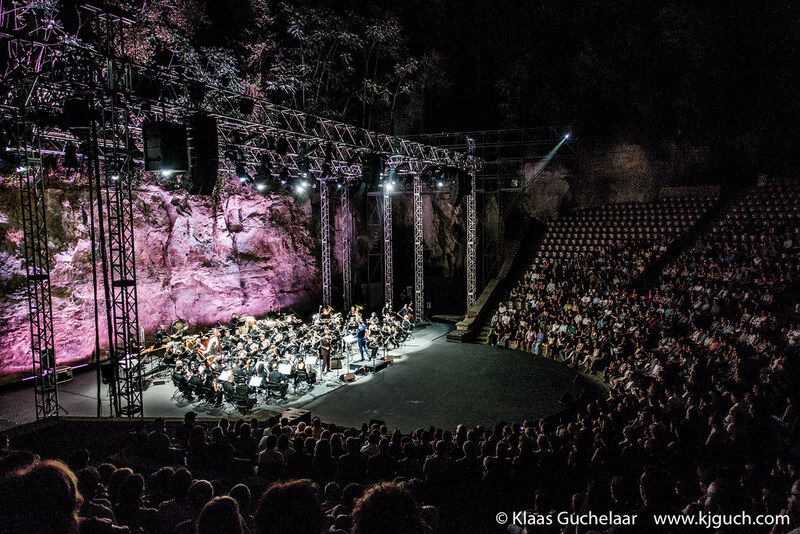 The Grec: A fantastic scenery for a concert! 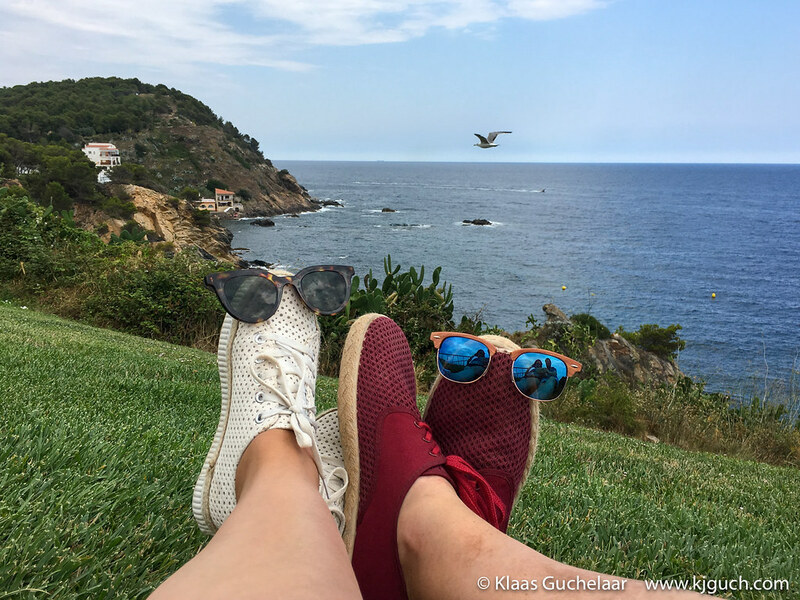 On Sunday we took a train and headed up the Costa Brava all the way to Palamos where we enjoyed a lovely sunny summer Sunday. We walked around the area a bit taking in the sun and the lovely views and then spent our final hours of the day on the beach. Standing and swimming in the water with some tiny fish swimming around me was a fun experience. And suddenly it’s Monday again, my last full day in Barcelona. Monica has headed to work and as it’s the last day I decide I want another go at the steep mountain climb I did with the group last week. This time on my own and where it was on our way back with the group I headed to that climb now straight away. It took a bit of a search but eventually I found it and started going up again. It was actually a lot harder not having someone cycling before me as I realised last week I was able to drag myself up because of him and now I only had myself. On the other hand I was now also able to stop and catch my breath (I convinced myself that is was to take photos) and with two wall timed stops and with again lots of heavy breathing and a pounding heart I actually made it to the very end where I could cycle. I made it!!! Then back down again and into te mountains for some more climbing and after 105km my last ride in Barcelona was over. The last thing I had to do was get the bike back into the travel-box, for which I needed some help from my new found friends at the bike store and then the bike was ready for traveling again. One last night out with Monica and then on Tuesday Monica helped me arrange transport to the airport. Going by busses on my own seemed a bit too much of a hassle and so we decided on traveling by taxi. It was a perfect ride, checking in my bike at the El Prat airport was as easy as could be and only then did the problems start… Funnily enough I saw the bike-box on the cart ready to be loaded into the plane as I was boarding so I figured all was ok.
Bianchi is in the box on the left cart, the last I’d see it for a few days! 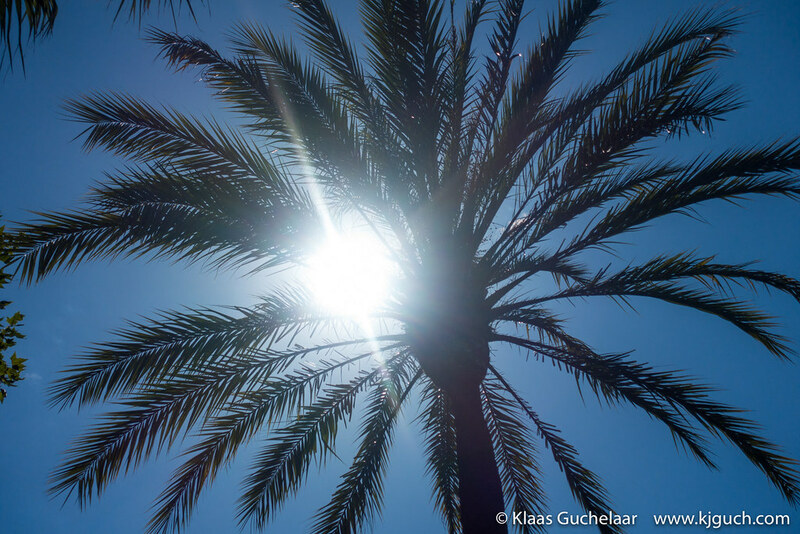 The flight didn’t cause any problems and then we landed as Schiphol. Luggage arrived at belt 6 and an announcement went around that ‘strange luggage’ would arrive on belt 7. Seemed perfect, right? Well, two hours later loads of strange luggage had arrived, but no bicycle. A couple next to my received only one of two bikes. The crew checkt transport, they checked the plane but no Bianchi was found. So in the end I filled in some papers, went back to my car and somewhat upset I drove home. Two days later luckily I was reunited with my Bianchi. The box obviously had fallen as one of the corners had taken a beating, but the bike was OK and that was all that mattered. So except for the disappearance of the bike the experience was really good and I can recommend it to all cycling lovers. I never really feared the cars, but cycling through tourists and pedestrians in Barcelona is a bit of a hassle. 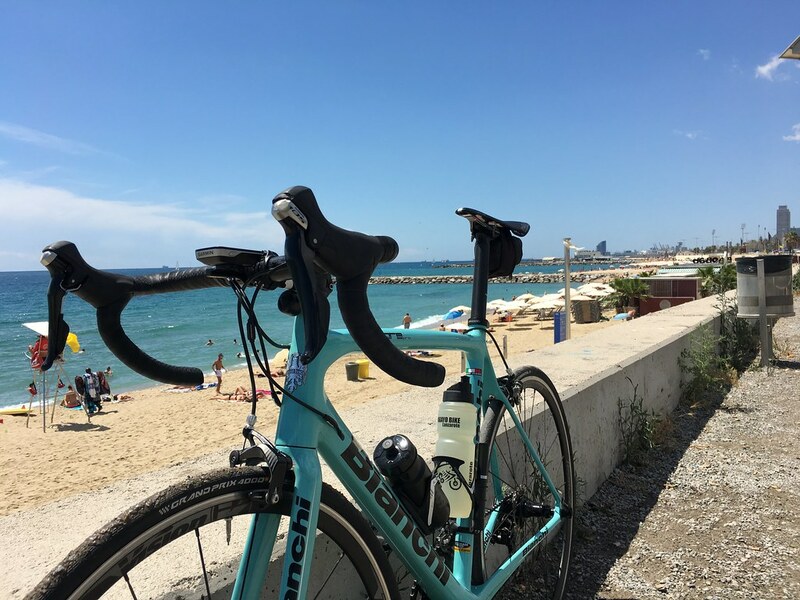 But I’m sure I’ll take the Bianchi along again somewhere abroad!